Traditionally enclosed with the wedding invitation, RSVP cards allow your guests to send back their reply and notify you of whether they will be able to attend your special event or occasion in a convenient manner. 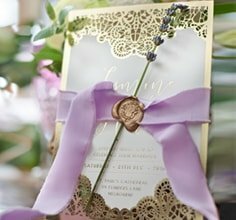 Wedding RSVP cards are an important tool for managing your guest lists as they allow you to set a particular time frame for your guests to respond to your invitation within. Without RSVP cards, keeping track of your guest’s responses has the potential to become quite difficult. It is also important to keep in mind that many caterers and reception venues will require an accurate number of attending guests in order to make the appropriate preparations, which makes sending wedding RSVP cards essential to the successful planning of your event. Additional information can also be included on your RSVP cards, such as options for your guests to select their meal preferences or list their dietary requirements. When you order your RSVP cards with Giant Invitations, we will include return envelopes with your details printed for the added convenience of your guests at no additional costs.